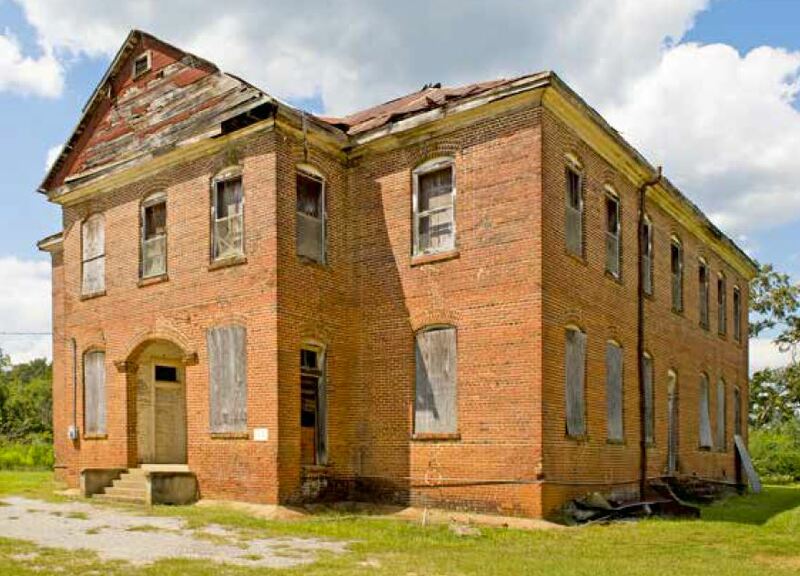 For a quarter-century, Alabama Heritage, the Alabama Historical Commission (AHC), and the Alabama Trust for Historic Preservation (ATHP) have collaborated to produce the annual Places in Peril list, which highlights the state’s most endangered historic properties. This year, Michael Panhorst evaluates the program’s history, reporting on its success stories, commemorating places that were not saved, and identifying structures still in need of preservation and intervention. Michael W. Panhorst, PhD, executive director, Landmarks Foundation of Montgomery and Old Alabama Town, has coordinated the Places in Peril program since 2013. A native of Montgomery and graduate of the New College of the University of Alabama, his research interests include monuments, memorials, and vernacular architecture. He is the author of The Memorial Art and Architecture of Vicksburg National Military Park (Kent State University Press, 2015); “The First of Our Hundred Battle Monuments,” Southern Cultures 20, no. 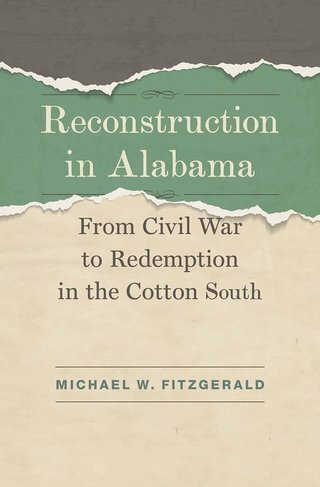 4 (2014); “Devotion, Deception, and the Ladies Memorial Association, 1865–1898: The Mystery of the Alabama Confederate Monument,” Alabama Review 65, no. 3 (July), 2012; and “Tabernacles: Open-Air Sanctuaries in Nineteenth-Century Alabama,” Alabama Heritage 115 (Winter 2015). He is currently surveying Alabama’s sixty-seven known extant grave shelters (above-grade structures that cover below-grade burials) and would appreciate any information on these rarities. Alabama Heritage publishes additional information on Places in Peril on its website here. 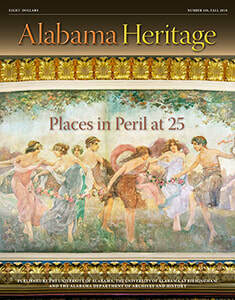 The cover image of this month’s Alabama Heritage depicts a mural at the Lyric Theatre. Titled “Allegory of the Muses,” the mural was painted by Birmingham artist Harry Hawkins in 1913 and has been in the Lyric’s proscenium arch since opening day, January 14, 1914. The shirtless man on the far right is the young god Apollo, who holds a lyre, from which the word lyric is derived. Along with restoring all the decorative paint and plaster in the Lyric’s lobby and auditorium, conservators from Evergreene Architectural Arts cleaned and restored the mural in 2015 during the Lyric’s $11 million restoration. Dumas, Ashley, Natalie Mooney, Valencia Moore, and Cory Sly. 2017. "Cabins As Far as the Eyes Can See: An Introduction to the Black Belt Slave Housing Survey." The Alabama Review 70(1): 22-49. Watch for more information about the extraordinary Manitou Cave of Alabama in the pages of Antiquity. For more information on the Powell School, please see www.alabamatrust.info/powell.php. www.cemeteryregistry.us/images/preservation_guides/Alabama_Preservation_Guide.pdf or contact its author, Lee Anne Wofford, Deputy Director, AHC. For the Mount Vernon Arsenal and Searcy Hospital white paper, please see http://www.alabamatrust.info/pdf/Mount_Vernon_Arsenal_Searcy_Hospital_at_Risk_white_paper.pdf. Atassi, Macon County, PIP 1999 This site in Macon County near the Tallapoosa River was occupied from around the year 1000 until the nineteenth century. Naturalist William Bartram visited in 1777. After years of conflict, World War I (WWI)’s conclusion was far from inevitable. 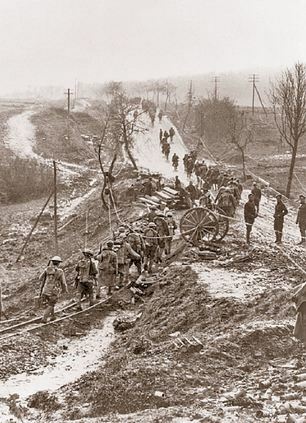 In fall 1918, Allied troops launched a significant offensive, the Meuse-Argonne, in Eastern France, hoping to force German troops back into their own lands. One particularly important area in the Meuse-Argonne centered around the Côte de Châtillon, also known as Hill 260. Hill 206 comprised part of the Hindenburg Line, an intricate German defensive system of several lines of trenches, barbed wire, and mechanisms to protect German soldiers and equipment moving to the front. 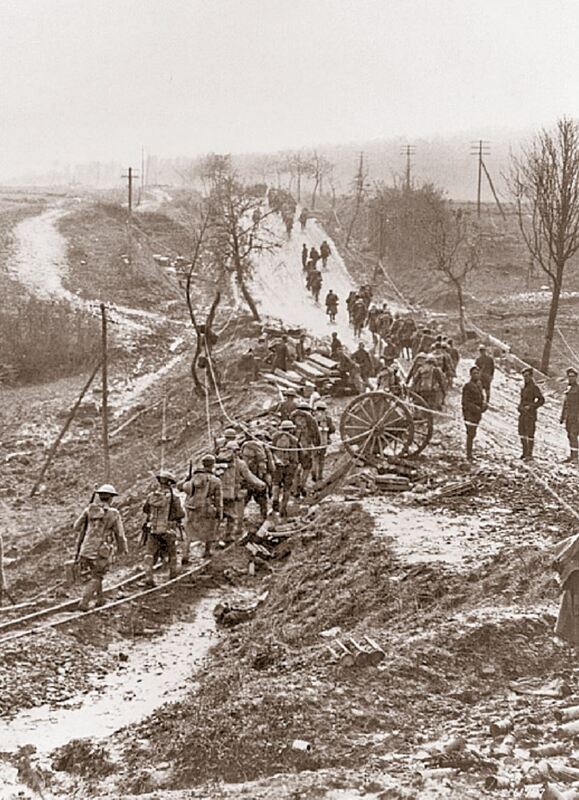 Several different American divisions tried to take the formidable Côte de Châtillon, and after the 35th Division and the 1st Division failed to take the hill, the 42nd Rainbow Division began its attempt, ultimately succeeding in this important mission that helped usher in the war’s conclusion. Nimrod T. Frazer was born in Montgomery, Alabama, to a family with a strong military tradition. 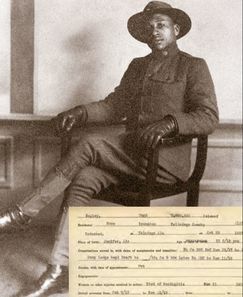 His father, Will, earned a Purple Heart as a rifleman in France in 1918. Following in their footsteps, Frazer enlisted in the Army in 1950 and volunteered for Korea. Serving as a tank platoon leader, he was awarded the Silver Star for Gallantry in Action. On returning to the United States, Frazer attended Columbia University and later received an MBA from Harvard. In recent years, he has dedicated much time to honoring the World War I service of Alabamians in the 167th Infantry Regiment of the famous Rainbow Division. He told their story in Send the Alabamians (University of Alabama Press, 2014). In 2017 France made Frazer a Knight in the Order of the Legion of Honor, and in 2018 the Daughters of the American Revolution awarded him its Medal of Honor. For more information about events commemorating World War I, see our Bonus Materials here. 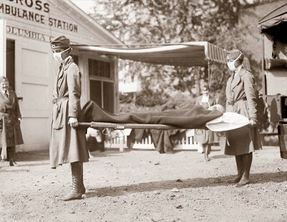 "It Came Like a Cyclone"
1918 saw a number of destructive events worldwide, including an influenza pandemic that claimed the lives of many people in different countries, including the United States. In Alabama the disease struck all facets of the population, and as medical professionals grew ill, everyday citizens stepped up to care for their family members, neighbors, and even complete strangers. Schools and churches closed throughout the state as Alabamians prioritized limiting the disease’s spread and helping nurse the infirm back to health. James L. Baggett is head of the Birmingham Public Library Archives and archivist for the City of Birmingham. For their research assistance, special thanks to Ned Harkins and the staff of the Mobile Municipal Archives; Scotty Kirkland and Meredith McDonough of the Alabama Department of Archives and History; and Gigi Gowdy, Catherine Champion, Don Veasey, Rosalind Brooks, and Barbara Hutto of the Birmingham Public Library. 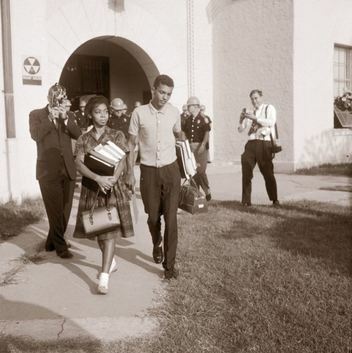 "It's Part of Me By Now"
For half a century, Mobile’s John LeFlore advocated for civil rights progress, tirelessly laboring for advancement even as he suffered threats and a bomb exploded at his home. LeFlore’s work dovetailed at times with the work of the NAACP, though the urgency he brought to his efforts sometimes put him at odds with that organization and its leaders. Throughout his lifetime—and particularly through his leadership of the Non-Partisan Voter’s League—LeFlore enacted significant change, particularly in Mobile’s elections. Archivist Scotty Kirkland chronicles LeFlore’s life and its profound impact on his community and the state. Scotty E. Kirkland is exhibits and publications coordinator at the Alabama Department of Archives and History. He holds degrees in history and social science from the University of South Alabama and Troy University’s Dothan Campus. He is the author of a forthcoming book on politics and race in twentieth- century Mobile, a project he worked on for more than a decade. A frequent contributor to Alabama Heritage over the past five years, this is his eighth article, and fourth feature piece (one more and he gets a set of steak knives). Scotty lives in Wetumpka with his wife, Jacqlyn, and their two children. Over the decades, George Barber’s teenage love for racecars grew into a full-fledged destination, the Barber Vintage Motorsports Museum. Among the newest items in the museum’s collection is a Lotus 11, and its conservation story reflects the museum’s care and dedication to each item it preserves. Complete with an extensive collection and a racing track for getting vehicles out on the road, the museum complex offers something for every automobile fan. Catie Stewart earned her bachelor’s degree in English and religious studies from the University of Alabama, where she is currently pursuing her master’s degree in literature. Alfa Insurance, sponsor of the “Alabama Makers” department in Alabama Heritage, is a Montgomery-based company committed to providing its family of customers with all of its life, auto, home, farm, and business insurance needs. In this quarter’s installment of “The Alabama Territory,” historian Mike Bunn describes Alabama’s 1818 territorial seal. This seal, reserved for official territory business, depicted the state’s all-important river system, which served as a transportation system for both people and goods. Despite such official trappings, however, not every development went smoothly in the Alabama Territory. As the year wound down, territorial officials struggled to agree on where to locate the capital, and emerging political factions competed to advance their own interests. Mike Bunn serves as director at Historic Blakeley State Park in Spanish Fort, Alabama. This department of Alabama Heritage magazine is sponsored by the Alabama Bicentennial Commission and the Alabama Tourism Department. 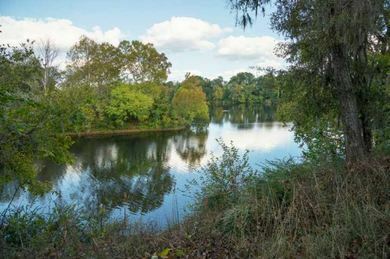 Those joining the stories in progress can find earlier quarters on our website at www.AlabamaHeritage.com. 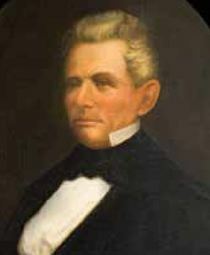 Alabama’s sixteenth governor, Andrew B. Moore, a schoolteacher and attorney, arrived in the state from his native South Carolina in his mid-twenties. Moore’s first term focused on issues close to him, including mental health. However, during his second term Moore oversaw the state’s secession from the union, for which he was briefly imprisoned after the Civil War. As part of their curatorial responsibilities, museum staff members devote extensive care to verifying items in their collection. 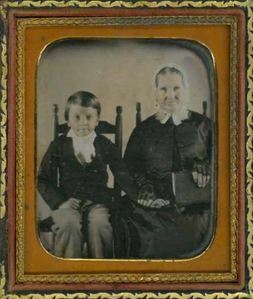 This quarter, Frances Robb explores how curators at Huntsville’s Burritt on the Mountain worked to authenticate a new addition to the museum: a daguerreotype depicting the great-great-grandmother and grandfather of Dr. William Henry Burritt, whose former residence houses the museum. Frances Osborn Robb is the contributing editor for the “Behind the Image” department of Alabama Heritage magazine. She is the author of Shot in Alabama: A History of Photography, 1839–1941, and a List of Photographers (University of Alabama Press, 2017). 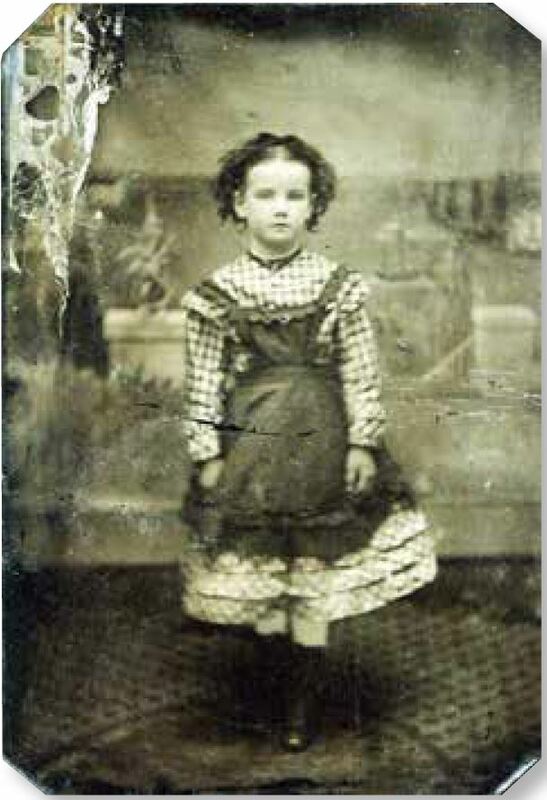 She is passionate about historic photographs and thanks Stephanie Timberlake for her assistance with this article. To find out more about Burritt on the Mountain, visit https://burrittonthemountain.com/. 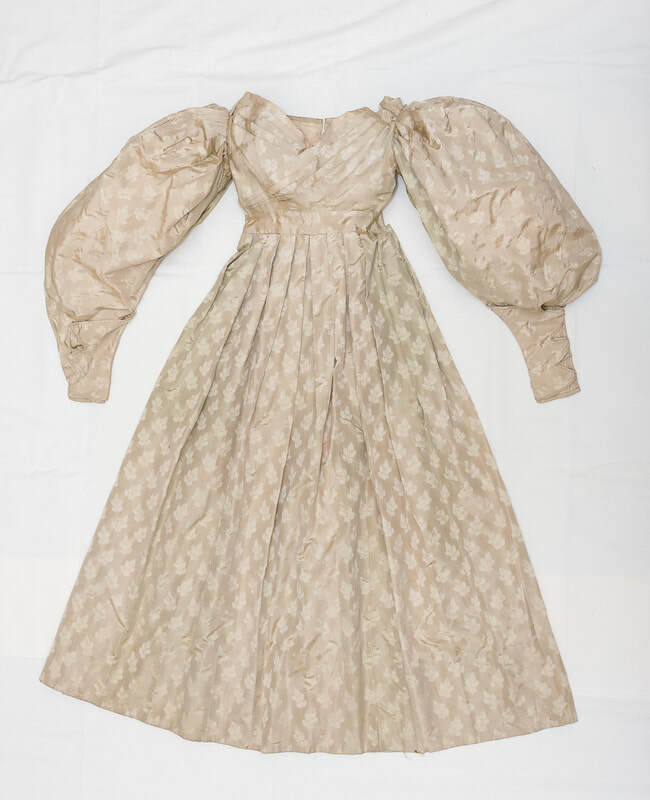 As explorers and new inhabitants began moving into the land that would become the state of Alabama, many aspects of life there changed, including the available textiles. Many items in the Alabama Department of Archives and History—including newspapers, advertisements, bills of sale, inventories, letters, and actual items of clothing—reflect the state’s changing preferences, revealing fashion preferences and the resources available during different eras of Alabama’s rich history. Diane Barnard is a museum collections curator at the Alabama Department of Archives and History. She will present an expanded version of this column at the Archives’ Food for Thought program on December 20, 2018. For more information about the Museum of Alabama, visit http://www.museum.alabama.gov/. As genealogy resources make it possible for everyone to explore family histories, the importance of proper storage for personal records and mementoes remains paramount. Archivist Martin Olliff reviews the best practices to follow to help keep your family’s photographs, records, and other documents safe and protected for generations to come. Martin T. Olliff served as assistant archivist at Auburn University, 1996–2002, then director of the Wiregrass Archives at Troy University Dothan Campus, 2002–present. He is also a professor of history at Troy University. He is the editor of The Great War in the Heart of Dixie: Alabama during World War I and author of Getting Out of the Mud: Alabama’s Good Roads Movement and Highway Administration, 1898– 1928, both published by the University of Alabama Press. Though historians often revisit and reappraise their predecessors’ understanding to various events, Reconstruction remains perhaps one of the most contested eras in American history. 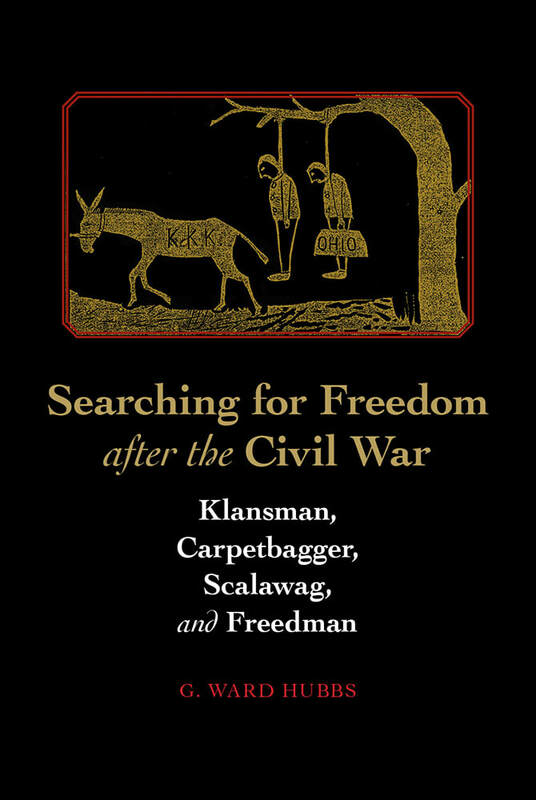 This quarter’s “Reading the Southern Past” reviews several recent books that return to that era: Reconstruction in Alabama: From Civil War to Redemption in the Cotton South (Louisiana State University Press, 2017) by Michael W. Fitzgerald and Searching for Freedom after the Civil War: Klansman, Carpetbagger, Scalawag, and Freeman (University of Alabama Press, 2015) by G. Ward Hubbs.